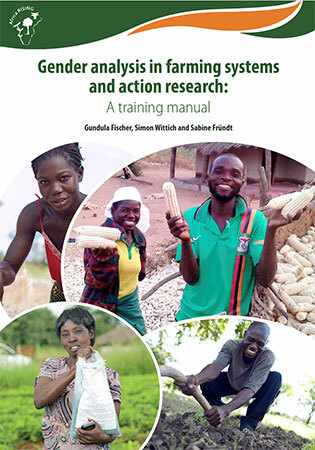 Gender analysis in farming systems and action research: A training manual. Systematic integration of gender analysis in the design and activities of a project or program is now globally acknowledged as a prerequisite and best practice for development and deployment of sustainable agricultural interventions. But for most projects (and individual scientists by extension), the question of capacity in gender sensitive research is still a stumbling block for meaningful progress. In this new publication co-authored by Gundula Fischer, Simon Wittich and Sabine Fründt, scientists now have a resource that will offer them tips and guidance for a spectrum of topics about gender mainstreaming. The publication, which is targeted at trainers working with newbies on the subject and even the fairly experienced, tackles a rich selection of topics ranging from the basic concepts for investigating gender in agriculture to how best to conduct a gender-sensitive technology evaluation. Although tailored to a specific program (Africa RISING), the manual covers aspects of gender analysis that are relevant to other actors working with similar objectives. More specifically, these are researchers that engage with smallholder farmers and other stakeholders to jointly develop and test agricultural technologies – technologies that not only enhance productivity and profitability and are environmentally sound, but also adapted to the differential needs of women and men farmers and benefit both in an equal manner. Gender sensitive research that promotes equity is a major crosscutting issue in CGIAR’s Strategy and Results Framework (2016–2030). And gender capacity development as well as stronger cooperation between social and biophysical researchers will facilitate this. The USAID-funded and IITA, International Livestock Research Institute (ILRI), and International Food Policy Research Institute (IFPRI) led Africa RISING program has now published its own contribution towards stepping up efforts in this direction – a training manual on how to do gender analysis in farming systems and action research. So far, the manual has been used for Africa RISING gender trainings in Ghana, Mali, Tanzania and Malawi. It can also serve as a resource for individual learning.